The online version of this article ( https://doi.org/10.1186/s13008-019-0046-8) contains supplementary material, which is available to authorized users. Resveratrol (RSV) is one of the most intensively studied natural compounds, due to its anticarcinogenic activity in many cancer cell lines and animal studies . However, the efficacy of RSV beneficial effects in human cancer is still an open question [2, 3, 4]. In this respect, RSV poor bioavailability represents a limitation for it use. To overcome this problem and ameliorate metabolism, different modifications have been introduced in the stilbene scaffold. As an example, methoxy derivatives, where two or three RSV hydroxyl groups are substituted with methoxyl ones, show increased lipophilicity, resulting in better bioavailability and higher antioxidant properties [5, 6]. We have recently shown that 3,5,4′-trimethoxystilbene (3,5,4′-TMS), whose stilbene scaffold is linked to three methoxyl groups, alters microtubule (MT) polymerization dynamics in cancer cells. 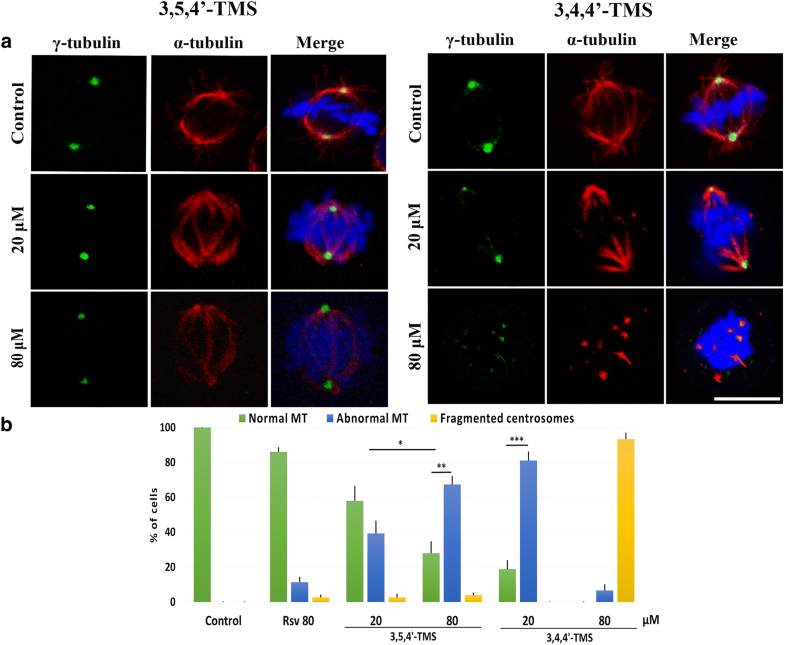 Specifically, 3,5,4′-TMS induced multipolar spindles and mitotic arrest coupled to reduced cell proliferation and increased apoptotic death through mitotic catastrophe. On the contrary, the di-methoxy derivative pterostilbene was found not to affect MT dynamics . MTs, consisting of α/β-tubulin heterodimers, play a pivotal role in mitosis by creating the mitotic spindle. In most somatic cells, MT nucleation occurs from the centrosome, which consists of a pair of centrioles surrounded by pericentrosomal material. This pericentrosomal material comprises also γ-tubulin, a homologue of αβ-tubulin, which acts as a nucleating agent by associating into a ring complex from where αβ-tubulin dimers assemble to polymerize into MTs . 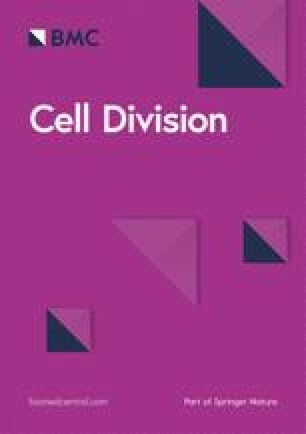 Literature data show that MT dynamics is altered in cancer cells [9, 10, 11] and MT targeting agents are of great interest to inhibit mitotic division of these cells. These molecules, known as antimitotic drugs, bind different domains within MTs (e.g., laumalide, taxane, colchicine and vinca alkaloid sites) and affect MT stability [12, 13]. Computational docking studies suggested that 3,5,4′-TMS interacts with the colchicine-binding hydrophobic pocket of β-tubulin . 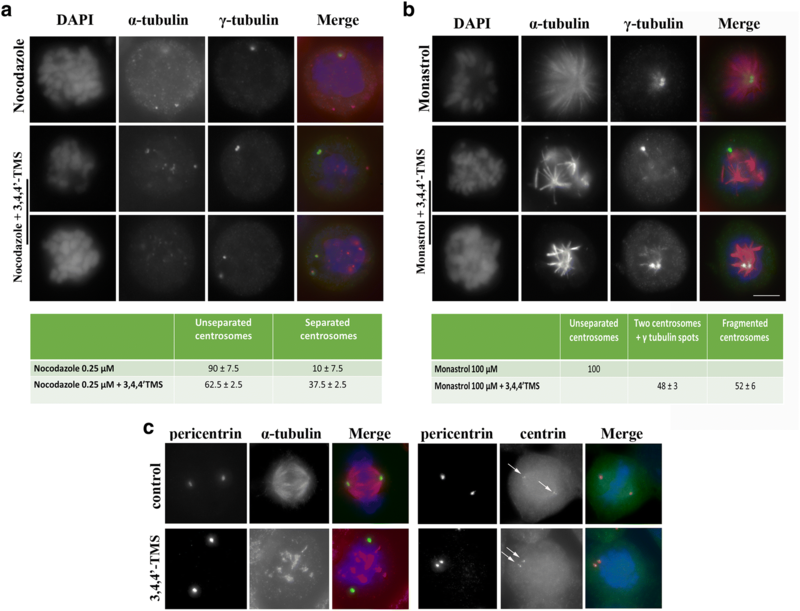 This finding is in line with our observation that 3,5,4′-TMS inhibits MT polymerization and, thereby, produces spindle multipolarity, DNA hypodiploidy and multinucleation in cancer cells characterized by supernumerary centrosomes . The structural modification of natural products such as RSV offers opportunities for the rational design of new chemotherapeutic agents. Indeed, it has been demonstrated that the presence of three methoxy groups on the stilbene scaffold, while improving bioavailability and conferring higher antioxidant activity [6, 20], leads to increased antiproliferative activity and apoptotic death coupled to inhibition of tubulin polymerization [7, 21, 22, 23, 24]. In this context we investigated the anticancer properties of two trimethoxy derivatives of RSV in human cancer cells. One molecule, 3,5,4′-TMS, was previously demonstrated to induce mitotic arrest through MT depolymerization ; the other one, 3,4,4′-TMS, was newly synthesized by our group to test the effect of a subtle modification, i.e. from meta to ortho configuration in the A-ring, on anti-cancer potency. Additional file 1: Figure S1. Representative flow cytometric histograms of HCT116 cells treated with 3,5,4′-TMS or 3,4,4′-TMS. X axis = DNA content, Y axis = number of events. Additional file 2: Figure S2. Alterations of mitotic spindle structure, cell cycle progression and apoptosis in SW620 cells. (A) SW620 cells were treated with 80 µM 3,4,4′-TMS for 2 h, fixed and stained with anti-α-tubulin and anti-γ-tubulin antibodies. 3D projections of confocal images of untreated and treated cells are shown. Scale bar, 10 μm. 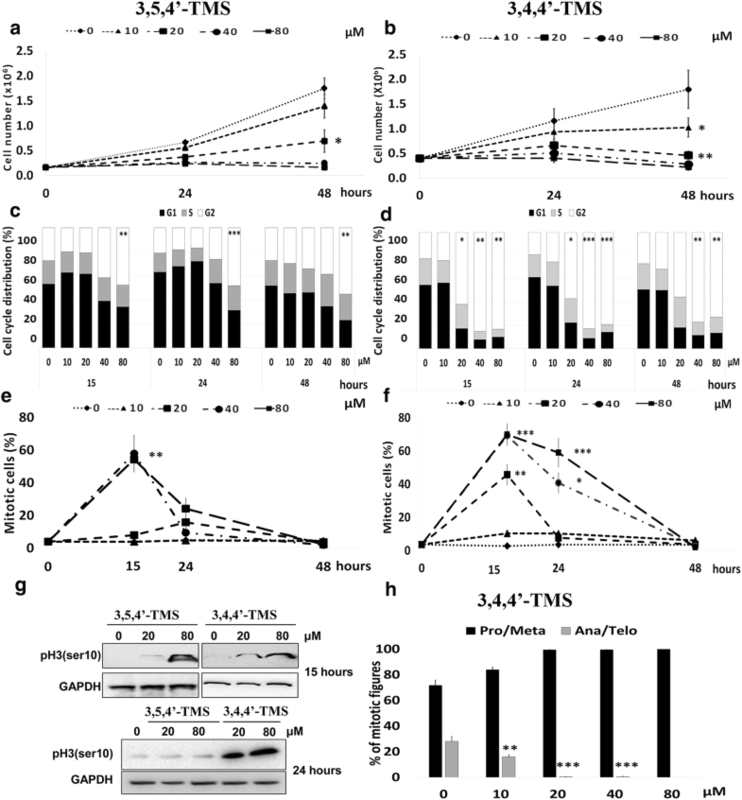 (B) Alterations in cell cycle progression and apoptosis following treatment of SW620 cells with 3,5,4′-TMS. (C) Alterations in cell cycle progression and apoptosis following treatment of SW620 cells with 3,4,4′-TMS. Additional file 3: Figure S3. Localization of different spindle pole proteins in 3,4,4′-TMS treated cells. HCT116 cells were exposed to 40 μM 3,4,4′-TMS and then immunostained with anti-Aurora A and anti-α-tubulin antibodies, anti-TPX2 and anti-α-tubulin antibodies or anti-Kif2a and anti-α-tubulin antibodies. DNA was counterstained by DAPI staining. Additional file 4: Figure S4. Redocking of colchicine to the α/β-tubulin dimer. The α- and β-tubulin monomers are shown as ribbon and coloured light and dark green, respectively. 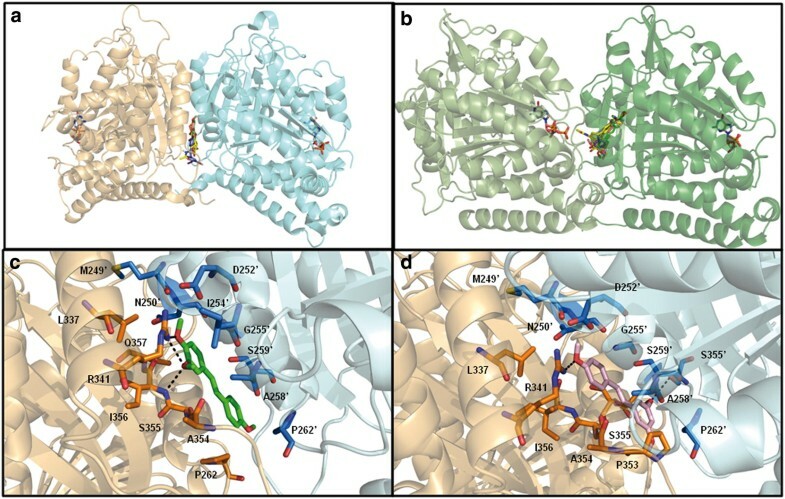 Colchicine and GTP are shown as sticks and coloured by atom type: N, blue; O, red; P, orange; C, yellow for colchicine imported from α/β-tubulin crystal structure to the homology model, and light brown for colchicine positioned by docking. Additional file 5: Figure S5. Comparison of colchicine binding to γ/γ- and α/β-tubulin dimer. β- and γ-tubulin are shown as ribbon and coloured dark green and cyan, respectively. Only β-tubulin and the structurally corresponding γ-tubulin monomers are shown, for clarity. Colchicine ligands are shown as sticks and coloured by atom type: N, blue; O, red; P, orange; C, yellow for colchicine imported from α/β-tubulin crystal structure to the homology model, and white for colchicine docked to γ-tubulin. Additional file 6: Figure S6. Chemical structure of the intermediate and final products of the synthesis of 3,5,4′-TMS and 3,4,4′-TMS. 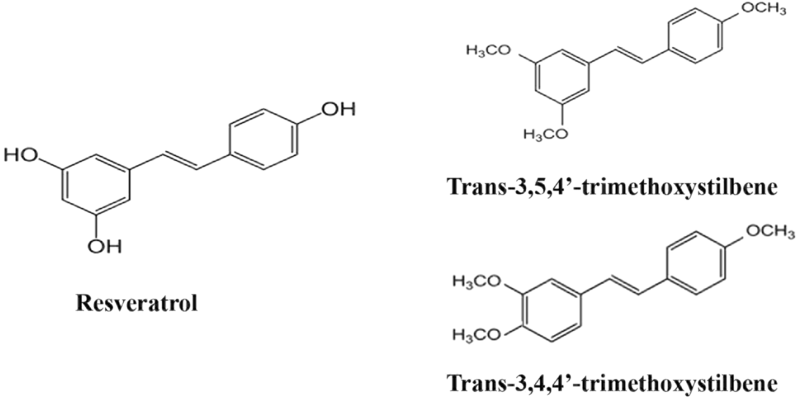 3,5,4′-TMS (5a) and 3,4,4′-TMS (5b) were synthetized by the classical synthesis of olefins using Wittig reaction with a slight modification. The ylide was generated by LiOH starting from the phosphonium salt (2). Then, the olefin products were obtained as mixture of cis and trans isomers by reaction with benzaldehydes 3a or 3b. The Z/E mixtures (4) were converted to the E-isomers 5a and 5b by heating with catalytic amounts of iodine in refluxing heptane. Additional file 7. Additional materials and methods.